Do you live in Pinellas County and have children who are ready to enter into pre-kindergarten programs for the 2019-2020 school year? If so, the time to apply is now. PINELLAS COUNTY, Fla. — Do you live in Pinellas County and have children who are ready to enter into pre-kindergarten programs for the 2019-2020 school year? If so, the time to apply is now. 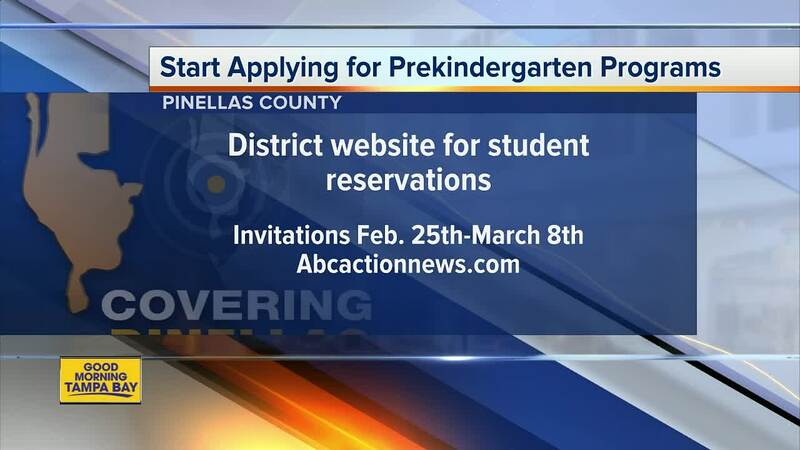 The application period for pre-kindergarten programs open Monday, January 21 and continues through Friday, February 1, according to the Pinellas County Schools website . If your children will be three years old on or before September 1 you should apply for PreK3 . If they'll be four years old on or before September 1 you should apply for VPK . To apply, you'll need to fill out the online application by February 1. If accepted, you will have to log back into the district’s student reservation system between February 25 and March 8 to accept the invitation for the program you applied your children to. For more information about the PreK3 program, click here or call 727-588-6000 ext. 2184. For the VPK program, click here or call 727-588-6513.